Regional transportation officials are getting ready to give their formal sign-off on toll increases scheduled to take effect Jan. 1 on the Bay Area's seven state-owned bridges. The Bay Area Toll Authority is expected to vote next week to go ahead with a $1 increase on the first day of 2019, the first of three toll hikes approved by voters last June as part of Regional Measure 3. The Jan. 1 increase will raise tolls to $6 on the Antioch, Benicia-Martinez, Carquinez, Richmond-San Rafael, San Mateo and Dumbarton bridges. Bay Bridge tolls will go up to $5 for off-peak weekday hours, $6 on weekends and $7 for peak (weekday morning and afternoon commute) hours. Revenue from the increases -- about $4.5 billion over the next 25 years -- will fund a package of about three dozen highway, transit and other mobility (bicycle and pedestrian) projects. The toll authority, made up of elected officials from all nine Bay Area counties who are also members of the Metropolitan Transportation Commission, held a pro forma public hearing on the increases last week. No one from the public showed up for it. So the increase is a done deal. Except for one thing. The toll authority is facing two lawsuits in San Francisco Superior Court, both of which challenge the validity of Regional Measure 3 on the grounds that its toll increases are a special tax. Under the state Constitution, the plaintiffs argue, tax measures require a two-thirds majority to pass. RM3, which its proponents argue is a user fee that needed only a simple majority to pass, got a 55 percent yes vote. The suits won't be resolved for a while -- and certainly not by Jan. 1, when BATA will start collecting the new tolls. So what will happen to all those extra dollars drivers will pay -- something like $2.5 million a week -- while the fate of the measure is thrashed out in court? All that cash will be deposited in a special bank account, not to be touched until the court cases are resolved. If the toll authority prevails in the lawsuits, it will get to spend the money as planned. If it loses -- well, first, that will blow a big hole in funding plans for many highway and transit projects, including procurement of some of BART's new cars. But beyond that, toll officials will have to figure out of a way to get that toll money back to the drivers who paid it. 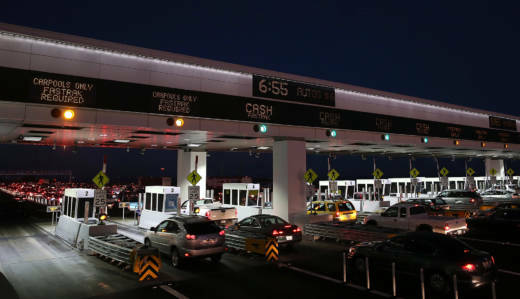 Randy Rentschler, the Metropolitan Transportation Commission's director of legislation and public affairs, says refunding tolls to drivers who use FasTrak toll passes will be straightforward since there will be a record of the charges they've paid. But the solution will be more complicated for the large population of commuters who still don't use FasTrak. "If you pay cash and have a receipt, then it's very simple for us to pay that dollar back to you," Rentschler said. "But if you don't have a receipt, really the only way we can do it is to have some sort of a toll holiday" during which tolls would be reduced. Rentschler pointed out that it's actually fairly common for voter-approved funding measures to face court challenges. Santa Clara County's Measure B, which imposed a half-cent sales tax to fund transportation projects, was blocked by a lawsuit immediately after voters passed it with a 72 percent yes vote in 2016. A lower court dismissed the suit, after which Santa Clara County began collecting the tax. Then the plaintiff appealed. The county continued charging the tax, placing the proceeds in an escrow account. By the time the county prevailed in the case last month, the account held $240 million.